Explanation: Faster than a speeding bullet, more powerful than a locomotive, and able to leap tall buildings in a single bound, this Soyuz rocket stands on the launch pad at Baikonur Cosmodrome in Kazakhstan on November 14. 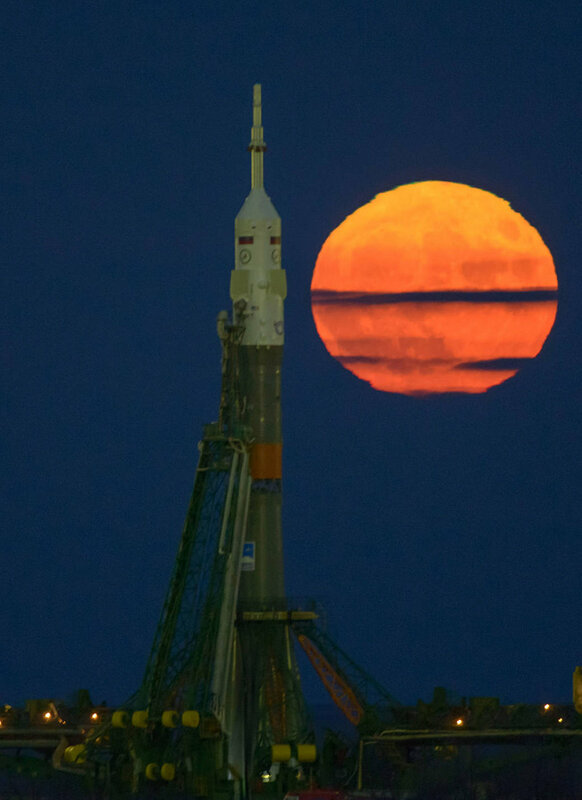 Beyond it rises a supermoon, but fame for exceptional feats of speed, strength, and agility is not the reason November's Full Moon was given this popular name. Instead, whenever a Full Moon shines near perigee, the closest point in its elliptical orbit around Earth, it appears larger and brighter than other more distant Full Moons, and so a supermoon is born. In fact, November's supermoon was the second of three consecutive supermoons in 2016. It was also the closest and most superest Full Moon since 1948. Meanwhile, the mild mannered Soyuz rocket is scheduled to launch its Expedition 50/51 crew to the International Space Station today, November 17.